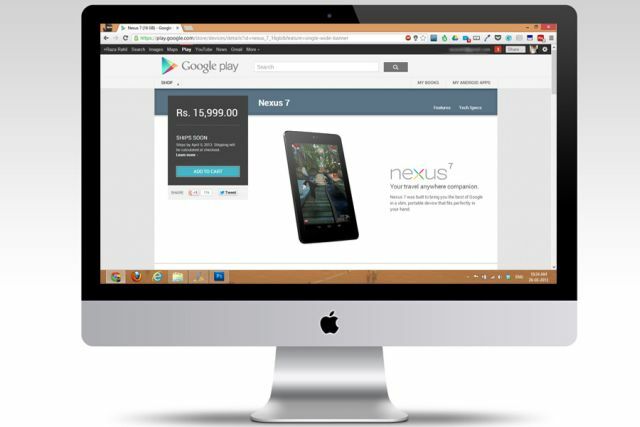 Finally after long wait, Google start selling it’s first Nexus device in India through Play Store. Google Nexus 7 16 GB Wi-FI is available in India directly from Play Store for affordable price of ₹15,999. The device will be shipped by April 5. Google Nexus 7 has 7-inch Display with 1280 x 800 HD display, 1.2 MP front-facing camera, NVIDIA Tegra 3 Quad-Core processor, Android 4.1 Jelly Bean (Upgradable to Android 4.2.2), 16 GB Internal Storage, 1 GB RAM and 4325 mAh Battery. Play Store listing says the device runs on Android 4.1 Jelly Bean, but you can update it to latest Android 4.2.2 Jelly Bean. No MicroSD slot, Connect Pen Drive via USB OTA Cable for more storage. Right now only Wi-Fi variant is available which is not good news as Internet penetration is not good in India, most of the population still relies on mobile network. But It’s welcome step from Google India, I hope 3G version and Nexus 4 will be soon available in India. Google now start focusing on India, First they released Navigation then Play Books and now Nexus 7.